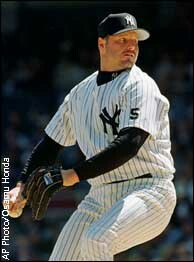 SP Roger Clemens (NYY) is not your average 38-year-old. Perhaps you've been asleep at the wheel and missed his 14-1 record. I hate the guy because he's kind of a shithead personally, but as a player it's hard to deny that he is one of the best pitchers of all time. He recently passed Tom Seaver for fourth place on the all-time strikeout list and is just 26 career wins from the magic 300. Clemens is another of the automatic, write them in pen, lead pipe cinch, no-doubt-about-it hall of fame players in the game today. Clemens is one of those talented players that have won on every level. He won the State Championship in 1979 with his American Legion team. He was the winning pitcher in the final game of the 1983 College World Series as Texas beat Alabama, 4-3. After wallowing in the Boston "curse of the Bambino" quandary and a stopover in Toronto - just long enough to win two Cy Young Awards - he joined the Yanks, where he has helped win two World Series rings. The Rocket has been the Yankees' most consistent pitcher since he's arrived in 1999.